As it happened - Broncos 40 def. Titans 32. 34. 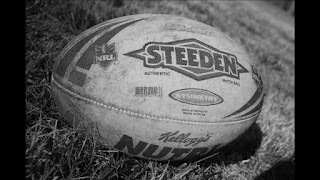 Look out for regular tweets during both the Titans v Broncos & Bulldogs v Knights tonight. Broncos and Dogs I think but lacking confidence! about 7 hours ago from web 33. Campbell opens the scoring slicing through poor defensive read. Prince converts GLD 6-0. about 5 hours ago from mobile web 32. Broncos strike back immediately, McCullough finishes off some champagne rugby league! about 5 hours ago from mobile web 31. Peter Wallace fires off a 40/20 to give the Broncos a chance to improve on 6-6 scoreline after 12mins about 5 hours ago from mobile web 30. Try Fest at Skilled Park. Israel adds some international flavour to the tryscoring list. BRI 12-6 after 17mins about 5 hours ago from mobile web 29. Error by Broncos not taking the kick off... Titans on attack about 5 hours ago from mobile web 28. Rogers is now on kick return duty. I like Rogers a little wider. about 5 hours ago from mobile web 27. Dave Taylor does his best Superman impersonation, catches a bomb next to the sideline but can't keep it in. 23 mins gone. about 5 hours ago from mobile web 26. Chris Walker tips on beautifully for Mead to score in the corner. Prince misses, BRI 12-10. about 5 hours ago from mobile web 25. Folau could have just Ski Doubled Up... Mead drops a bomb. Video ref time... Go get a cup of coffee. about 5 hours ago from mobile web 24. Try given to Folau. Parker converts and it's 18-0 after half an hour. about 5 hours ago from mobile web 23. It's all happening! Yow Yeh touches down off Karmichael Hunt grubber. Parker misses. BRI 22-0 after 34mins. about 5 hours ago from mobile web 22. Wallace and Thaiday the standouts thus far. about 5 hours ago from mobile web 21. The Dave Taylor Show has come to Skilled Park, Sets up Folau down the left who finds Lockyer to score. It's a Kenny Carve Up BRI 28-10. about 5 hours ago from mobile web 20. At halftime Brisbane 28 lead Gold Coast 10. Seven tries in all. about 5 hours ago from mobile web 19. Lockyer cops a sneaky left shoulder from Chris Walker... Gets the penalty, Parker will go for 2. about 4 hours ago from mobile web 18. Brisbane up by more than 3 converted tries. BRI 30-10 just after halftime. about 4 hours ago from mobile web 17. Gordon 90m intercept try keeps the Titans alive! about 4 hours ago from mobile web 16. Prince misses so it stays 30-14 Broncos, Titans on attack though. about 4 hours ago from mobile web 14. Ned Kelly scores to keep Titans alive. BRI 30-20 after 55mins. about 4 hours ago from mobile web 12. Twitter having issues but Kevin Gordon isn't - scores again in left corner. It's on like Donkey Kong! about 4 hours ago from web 11. According the crowd is making cappuccinos! 'Frothing' says Fatty. Now Folau scores his 3rd! about 4 hours ago from mobile web 10. This is crazy, that's 11 tries already after 64 mins. BRI 34-26 about 4 hours ago from mobile web 9. Update from Toyota Up. Broncos smashed Tigers and Raiders win in extra time over Manly confirmed. about 4 hours ago from mobile web 8. Titans need to score before 70th min to be a chance I feel. about 4 hours ago from mobile web 7. Mead is flowing for the Titans! He scores of Prince chip kick, Hunt unseen. Titans alive down 34-32. about 4 hours ago from mobile web 6. Rogers knock on crucial. Can Brisbane finish them off with 6 to go. about 4 hours ago from mobile web 5. Should time have been called off for Rogers being hurt? Taylor takes intercept and Rogers not at fullback. Controversy! about 4 hours ago from mobile web 4. Game over as try given. Broncos will go on to week two. Titans could go out if NEW & PAR win. about 4 hours ago from mobile web 3. Bold call from a Brisbane supporter here. "We might win now..." Bold sir! Bold! about 4 hours ago from mobile web 2. Broncos 40 lead Titans 32 with 2 mins left. about 4 hours ago from mobile web 1. QF2 Final Score: Brisbane 40 def. Gold Coast 32. Wallace, Folau, Thaiday, Lockyer best for BRI. Gordon, Mead, Walker Meyers for GLD. about 4 hours ago from mobile web ===================================================================== Final Score 2nd Qualifying Final 2009 BRISBANE BRONCOS 40 Tries: I Folau 2, A McCullough, J Yow Yeh, D Lockyer, D Taylor. Goals: C Parker 6/8. 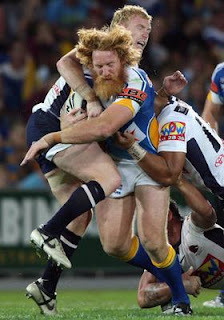 Defeated GOLD COAST TITANS 32 Tries: D Mead 2, K Gordon 2, P Campbell, B Meyers. Goals: S Prince 4/6. @ Skilled Park, Gold Coast. Saturday 12 September 2009. Official Man of the Match: Peter Wallace, Broncos. NSC Man of the Match: Peter Wallace, Broncos. Glenn Lazarus Player of the Finals Points: 5 - Peter Wallace, Bulldogs. 2 - Dave Taylor, Broncos. 1 - Israel Folau, Broncos. Game Rating: 2.5 out of 5. One Line Game Review: The game was very entertaining if tries are your cup of tea, but neither side can be overly happy with the way they played - as defence went out the window. ===================================================================== What the result means? Brisbane will have a home final in Week Two of the NRL Finals, while the Gold Coast are now safely into Week Two with the Knights loss to the Bulldogs. Below is the Qualifying Finals Review & first look at the Elimination Finals Matchups Video.